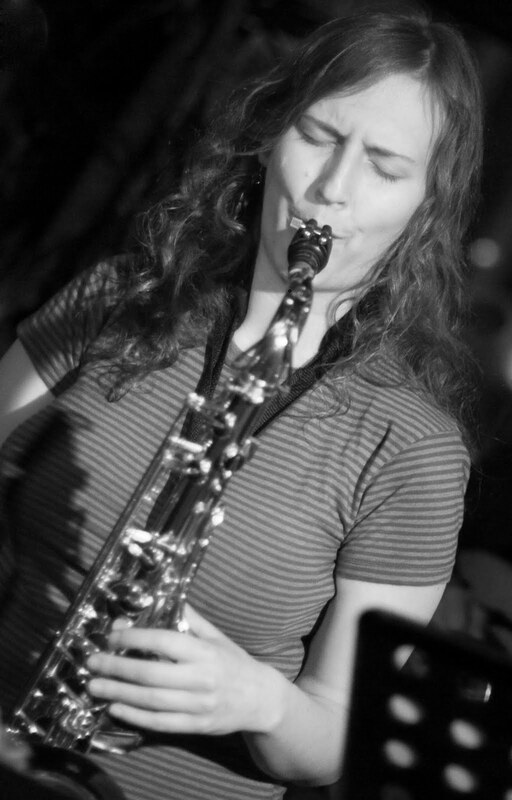 At 26, tenor saxophonist and flutist Anna Webber is one of a growing number of Canadian-bred talents now making their way beyond our national borders. A native of the British Columbia interior, she received early exposure to music via her mother, then after dabbling with piano and cello she finally settled on flute. In her final year of high school, she took up alto saxophone first, only to find a real voice when she switched to tenor sax. Heading East to Montreal in 2003, she completed her B.A. in jazz studies at McGill University three years later. In 2008, she was off to New York to pursue her Masters at the Manhattan School, completing her studies just last spring. Last October, she returned to her former home base to perform with one of her groups at the Off Festival, a performance that netted her the festival's annual Prize honoring the most promising new band. On the day after her show, and only hours before the announcement of the award, she met this writer to provide a bit of insight on her activities recent and current in the Jazz Mecca. Marc Chénard: After you finished your studies here in Montreal, were you already considering moving down to New York? Anna Webber: Actually, before finishing at McGill, I was already starting to go down there once or twice a year, to take lessons with Mark Turner. M. C.: Was it your intention to move there specifically to study or become part of the scene? A. W.: No, it was really to enroll in the Masters program at Manhattan School of Music. But once there, I realized it was more important to be there in the city than pursuing studies. Still, if there's a place to do a masters that would be the school to go to, so one kind of worked with the other. Thankfully, I got a year extension on my student visa, so that has enabled me to stay there since graduation in May of last year. M.C. : I gather that being there is quite different than just making a trip here and there, as you did at first. A.W. : Absolutely. When you're there, you have the chance to see all sorts of things. It's a real party. You realize just how much there is, and if you try to catch what's going on, then you run out of money pretty quickly. Also, the study program at Manhattan is pretty intense and there's a lot of work involved. M.C. : Tell me a bit about your studies, like some of the teachers. A.W. : Last year, I studied with (tenorman) George Garzone and pianist Jason Moran, in my first year, I spent time with Steve Wilson and Jamie Baum, she's the flute player there. M.C. : With two different instruments like tenor sax and flute, do you feel it requires you to work with them in different ways? A.W. : I thought so in the beginning. I played flute for five years before taking up sax, so I spent a lot of time at first with working out issues of sound, tone production and working out the differences between the two. Now, I'm at the point where they help each other. I definitely hear different things on sax and flute because of their ranges, embouchures, but now I can go from one to the other more easily, so in a way they are coming closer to each other, though I sometimes feel better or more comfortable on than the other. It depends on the days. M.C. : Did studying with those players you mentioned really help you shape your own playing? M.C. : What impresses you in particular with Mark? A.W. : He's one of the deeper musical personalities I know of, and I still go to see him for private lessons, maybe once a month. M.C. : What does he give you to do? Specific assignments? A.W. : More recently he has been doing that with me, like technical exercises, and his own concept of voice leading. He thinks very pianistically. Garzone was also a very great person to study. He's pretty well taught every saxophonist in NY under 45, Mark has studied with him, just like Seamus Blake, Christ Potter, Chris Cheek, Donny McCaslin, so he's been a huge influence on just about everybody here. He has his own triadic concept, and I worked on that for a year and a half. I also have to say he's really supportive. M.C. : You now have your first record out, Third Floor People, and on it there are two different quartets, a Montreal one and a New York one, each one with guitar but not bass, but a trumpet player in the latter and an alto player in the former. In New York, it's well known, that having a working band is a challenge to say the least, because everybody has to keep busy in about 25 different bands just to pay the rent. It must be no different for you to be able to work with those particular musicians there and trying to keep your own things going? A.W. : Yeah, it's much different there than in Montreal. It's kind of frustrating because everyone is so extremely busy, me included. M.C. : Your band mates, those in New York, I gather you knew them through school? A.W. : That's the case of Matt Holman, the trumpeter. Owen Stewart-Robertson, I went to school with him at McGill, and I kind of knew Fred Kennedy through Owen, so we had mutual friends. He's Canadian, too, from Halifax I believe. M.C. : You just mentioned that you were also quite busy, so who else are your working with now? A.W. : I just recorded with another Canadian I went to Manhattan school with, Dan Jamieson. He's an alto player and composer. I just did a big band record with, so I play in that one, too. I gig around with other bands, but those are on a more occasional basis. I now have another band called Field Vision, and Rick Rosato (a bassist from Montreal) is playing in it. I'm also working with two German guys, who came from there to study, so that's one project I'm actually playing more with, and I actually share a place with one of them (in the Washington Heights district of Manhattan), which gives me the opportunity to work with him. M.C. : What are some of the things that struck you most about the scene there in comparison to the one here in Montreal, apart from the depth and size of it. A.W. : It's obviously the Mecca for Jazz musicians, so you see so many young players heading there, some of whom are just passing through for a while, with others really wanting to make it there. There are tons of people my age living there, and there is plenty of transiency, many of which might be there for a year and realize it's not for them. Montreal in contrast is more of a place where people come to and decide to settle. New York is also a place that attracts people who are very driven, whatever field they are in, so they really want to be there. It's a city for the ambitious. Montreal is much more laid back, and I like the pace of life here much better, it's cheaper to live for one, and you have more time to do what you want to do, other than just struggling to pay the rent. It's much easier to have a working band here, so you can play more often as you are less busy, and can book more shows as well as rehearsing on a more regular basis. M.C. : On the topic of New York attracting people who are very driven, you must have come across a number of individuals like that, some of whom become sort of 'cliquish' and form closed circles that might be hard to access for someone outside of it. Do you feel that that is very much the case, where there are places that are hard to become part of? A.W. : Yeah. There is a business aspect to jazz that I am not particularly good at, but I'm learning a lot about it. There are definitely some people who do spend a lot of time on the business end of things, and they seem to get a lot more exposure, which seems to go with their type of personality. Or they hire a publicist, if they can afford doing that. So there are definitely cliques and circles. Like you have a very free music scene in Brooklyn, or a more straight ahead one coming out of Juilliard, or those around the Manhattan School of music. M.C. : You go and check out these different scenes? A.W. : Yeah, sure, I have friends working in different scenes, like this band of mine (Third Floor People) has people working in the more open scene, if you will, whereas my other group Field Vision is a little more straight ahead, not just straight ahead, because it's still me. It has my own esthetic, but it's definitely more 'jazzy' than my own band. As for myself, I really like a variety of things, really straight ahead stuff, but also noise music, so I definitely like to check out a lot of things, and really don't want to pigeonhole myself to any scene. M.C. : You set yourself up for a good question, as you said "my own esthetic". How would you define that? A.W. : Hmm, I don't know how to answer that offhand. To me, it's what has an emotional impact on me. Hearing musicians playing a head, then taking solos on changes and playing the head out can be the most interesting thing in the world, or the most banal one, that depends on what how the musicians are listening and how they are improvising, even if the people are improvising, at least in theory. I can listen to players I like listening to, but I can't really tell you in specific terms what my esthetic is. M.C. : You're still working on it? A.W. : I don't know if I can really describe it. M.C. : Earlier on, you mentioned about really getting in to Mark Turner to the point you started transcribing one solo after the other. Is that your nature, like getting fixated on one thing and pursuing it intensively for a while? There are other people who sort of scatter themselves more and pursue several things at the same time, so I was wondering if you are more of one than the other? A.W. : Well yes, although now I'm not trying to fixate as much on one or the other person, because I really want to develop more of my own thing. Yes, I definitely did a lot of transcribing in the past, like a big Coltrane phase, or a Shorter one, and other sax players as well, like Warne Marsh, Lee Konitz or Steve Coleman, who I listened to a lot for a time. So there was a time where I was very much focused that way, checking out this or that one to find out what they were doing specifically. I have to admit to having fixated myself on one or the other player for a few months, or years in some cases. M.C. : In New York, there are so many places to check out the music, and of course, there are the major clubs and venues that everybody knows about, but there are plenty of places less well known, except for the insiders of the scene, so can you give some tips or recommendations in that regard, those where you can catch, say, the more current or contemporary New York jazz scene, either in Manhattan or Brooklyn? A.W. : In Brooklyn, you have a place DSMC, at 295 Douglas Street, and it's a presentation space/concert hall that is collectively managed. But there's in fact a loose collective of 15 or so musicians involved in it. Josh (Sinton) plays in Darcy James Argues big band (The Secrete Society), he's a pretty free music dude, but then there is Ben Wendel, from Kneebody, more of a kind of straight ahead band. Also, you have a really wide range of people, like Matt Moran, who also plays in Slavic Soul Party and John Hollenbeck's Claudia Quintet. I did my New York record launch there last December. The label (Nowt) is currently operated by Owen and bassist Aryeh Kobrinsky. Anyway, there are a whole bunch of musicians who rent a space at Douglas Street. It's a really cool spot, and artist run, too. Of course, another cool place is the Stone, that's John Zorn's place in Manhattan. But I like going to the big clubs as well, when I can afford it, but seeing a show at the Village Vanguard is really amazing, it's so intimate. For instance, seeing Brad Mehldau there is really worth the 40 dollars or so for the evening. M.C. : I gather the learning curve for you has been a steep one in the last two years, but pretty rewarding. New York is a deep pond, and you have to be able to swim in it. A.W. : Yeah. You definitely have to go to New York at some point to go find the music, but I think the jazz community is pretty strong throughout the world now, because you can find the music pretty well anywhere you go. After all, there is a certain history of the jazz tradition that is quintessentially American. And even if you play more free music or whatever, I mean you can't play free music without checking out the older stuff, but there is an honesty that comes from having that tradition in your playing. And just the way people swing in New York is totally different than here in Montreal. And it's also just a question of being exposed to the kind of players at the Manhattan School of Music or just in the city, and being able to play with these people on a regular basis is so great. M.C. : What did or do you find particularly rewarding with your studies at the Manhattan School of Music? A.W. : I think it has the best Masters Program in New York City, and yeah, I'm biased because I went there, but I definitely hated a lot of stuff when I was there, but I won't expand on that. To get into the school, you have to be able to play straight ahead jazz. But once you get into the program and you deal with the teachers, like Dave Liebman and his master class on harmony, you find out they are really open guys, and they've checked out a lot of interesting stuff, and direct the students to work on some more harmonically complex areas that others would not get into. As for Juilliard, at least from what I have heard, it's extremely straight ahead, and there are other cheaper schools too, like the State University of New York, or Queens College or City College that have really good programs, at least from what I've heard and talked to people about. But when it comes to acquiring a mass of information you are getting and the quality of players there, I think the Manhattan School of Music is really the best. M.C. : From the outside, it's often seen that New York is a highly competitive environment, yet your observations seem to indicate that there is more cooperation than we generally think. A.W. : Well, it's all personality-based. I'm not a competitive person, so I wouldn't get involved in those types of situations. But if you want to be competitive, you can have an extremely competitive time in New York. Since I'm not into that, I don't want to portray myself in another way that I am, or try to get ahead by sleazy means. I just want to do what I want to make and with the people I want to do it with. If somebody gives me an attitude, or something like that, I just don't want to deal with that. M.C. : After two years there, do you feel comfortable, or settled in? A.W. : Well, I could say so. More or less. M.C. : Were there moments when you may have had second thoughts? A.W. : Oh yes, absolutely. I don't want to live in New York for the rest of my life. It's the right city for me to be in right now, but I don't know if I could be there in year's time. Being Canadian, there are also visa issues. As I am on an extension of that visa, that covers a period for getting optional training, and that runs out this year. Mind you, I could get an artist's visa to stay, but I'm not sure if I want to stay longer. M.C. : If not New York, where then? A.W. : Well, I'd like to go to Berlin. I'm learning the language, and my two roommates are German. So we'll see.